Mike Russell from England won the 2008 World Billiards Championship. 2006 champion Geet Sethi from India took silver after losing 1821-1342 in the final. 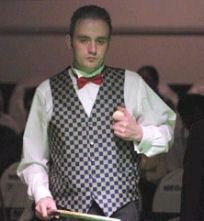 Last year's runner-up Chris Shutt (England) and David Causier (England) finished joint third. Just like last year Russell had the two highest breaks in the event; a 588 and a 272. He has now won a record nine world pro titles; 1989, 1991, 1996, 1999, 2002, 2003, 2004, 2007 and 2008. Some say it is ten since his name was also engraved on the trophy in 2000, even though there was no world championship that year. Update: Billy has informed me that Mike's name now has been removed from the trophy for 2000. The championship was held July 23-27, 2008 at the Northern Snooker Centre, Leeds, England. Hello, His name has since been taken off the trophy for 2000, as you are right there was no contest that year.